In late 2013, the Bushfire and Natural Hazards Cooperative Research Centre was launched at Parliament House, Canberra, with high expectations and widespread support. The Minister for Justice, the Hon Michael Keenan declared that the new $130 million research centre would draw together all of Australasia’s fire and emergency service authorities with the nation’s leading experts across a wide range of scientific fields to explore the causes, consequences and mitigation of natural disasters. 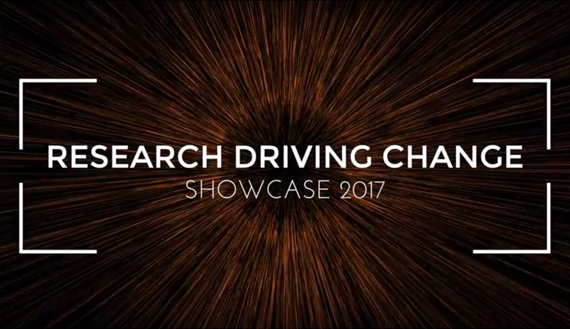 In July 2017, the CRC and its partners gathered in Adelaide for Research Driving Change – Showcase 2017. That event celebrated the achievements of the first four years, and acknowledging the many practical uses of the research; by CRC partners and by others. Here in one place are the highlights and achievements of the CRC to date that aim to save lives and reduce disaster-related costs. The CRC is conducting research to build a disaster-resilient Australia. The research program has been developed and delivered under the direction of the researchers and end-user agencies. 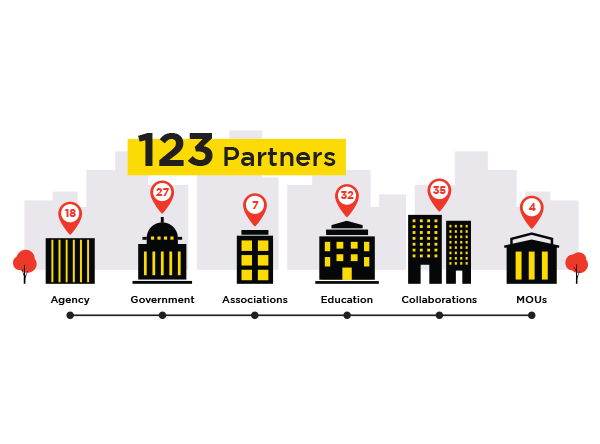 Now in our fifth year of operation, researchers and end-user partners are working closely together to ensure that the research is embedded into the planning, policies and operations of partner organisations, and into the development of new research projects. The CRC draws together all of Australia and New Zealand’s fire and emergency service authorities with the leading experts across a range of scientific fields to explore the causes, consequences and mitigation of natural disasters. This combined effort is helping to build disaster resilient communities. The CRC conducts a multi-disciplinary research program on the major national issues across the natural hazards spectrum. The CRC is a partnership of all Australian and New Zealand fire, land and emergency service agencies; more than 30 universities; plus many federal, state and local government departments; professional and volunteer associations; and non-for-profit organisations. From mid-2013 and backed with $47 million over eight years from the Australian Government, plus contributions from its member organisations, the CRC has been undertaking research that supports the development of cohesive, evidence-based policies, strategies and programs to build a more disaster resilient Australia. The CRC is providing a long-term knowledge base that directly supports emergency services and other government and non-government agencies protect their communities through work to prevent, prepare for, respond to and recover from natural disasters. In this publication the CRC looks back, forward, and beyond. The Bushfire and Natural Hazards CRC has reached an important juncture – four years into its intial funding term, with four to go. Already, we have shown that the program of research, driven by end-users, can deliver significant benefits to our emergency management partners and the community. social costs of disasters in Australia and New Zealand are projected to increase greatly. Each nation acknowledges its financial and moral obligations to mitigate the risk to its communities and infrastructure. As pleasing as our results have been to date, we cannot afford to think we have done enough – we must continue to maintain our relevance and impact. We are now thinking and planning beyond the next four years because the need for an evidence base relevant to those challenges is constant. We are asking what a future entity might look like, what it would do, and how it would be funded. This is your natural hazards research centre. We hope you will help us deliver for the community through your active involvement in the research use. Reduce the risks from bushfire and natural hazards. Reduce the social, economic and environmental costs of disasters. Contribute to the national disaster resilience agenda. Build internationally renowned Australian research capacity and capability. The first ‘C’ in CRC is all about being a cooperative, a network of local, national and international projects, with a pool of ideas and resources. The CRC has created a space for discussion, learning and development of natural hazards science and disaster resilience in Australia through regular conferences and activities, and publications. The business of the CRC is focused research into operations and policy, with a strong feedback loop of allowing operations and policy to inform new research. This makes the CRC dynamic and responsive, with all partners an essential part of that research loop. With the creation of new knowledge through research, the CRC develops the skills and knowledge of partners, researchers, students, and the community. This is the final step – when the CRC harnesses its collective strength, creates a forum for knowledge, and manages the research loop, then it will have developed a capacity in its people (both researcher and agency personnel) to deliver research that is relevant, accessible and ready to be used. The strength of the CRC lays in its collective nature. As a cooperative research centre, the CRC is a collection of people and individual organisations, that bring a range of values to the whole. The CRC operates as a hub, creating bridges that link disparate and diverse groups together in a network focused on innovation. With more than 250 researchers and 250 agency staff in Australia and internationally directly involved in the research projects - with many more indirectly involved - the collective strength is an efficient and effective way to advance the science of natural hazards. The CRC provides a research capacity that is not feasible at the individual state or territory or agency level, nor with any one university or research organisation. Core funding through the Australian Government’s CRC Programme combined with contributions from all partners (cash and in-kind) creates a pool of resources large enough to tackle research questions at the national scale. With the resources pooled and the research outcomes shared, the return on the investment for any individual partner is significantly better than if it was to pursue the research aims alone. An extensive series of workshops were conducted from 2015-17 to explore major issues across hazards, resilience and the community. The workshops were mostly conducted in collaboration with organisations that are major representative stakeholders, including AFAC groups and networks, the Bureau of Meteorology, and fire and emergency service agencies, plus other relevant community and industry groups. The purpose of the workshops was to identify the critical national issues that could be addressed by research. Those issues will influence the future research program of the CRC and other research groups in the sector. 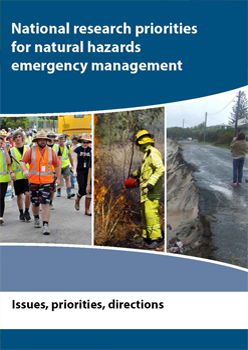 The outcome of the workshops was the publication of a national natural hazards emergency management research priorities statement Issues, Priorities, Directions (published in July 2017). This publication was considered and noted by the Council of Australian Governments’ Australia-New Zealand Emergency Management Committee in June 2017. The 2015 launch of the Australian Institute for Disaster Resilience commenced a partnership between the CRC, AFAC, the Australian Red Cross and the Attorney-General’s Department. The new Institute was formed to deliver products and services around Australia that have been developed by, and for, the broad emergency management sector. 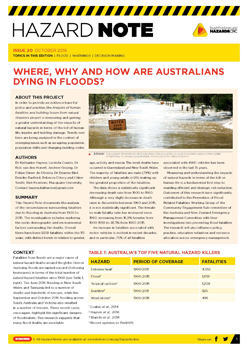 The CRC has taken the lead role in the Institute’s Australian Journal of Emergency Management. The CRC is the national coordinator for a United Nations-backed committee that promotes and supports disaster risk reduction research around the globe. The Integrated Research on Disaster Risk (IRDR) National Committee for Australia is sponsored by the United Nations International Strategy for Disaster Reduction, the International Council for Science and the International Social Science Council. Through this arrangement there are many opportunities for the CRC to align its projects with the international disaster risk reduction strategy. Researcher Prof Kevin Ronan represented the CRC at several IRDR workshops and meetings on the implementation of the Sendai Framework for Disaster Risk Reduction. Researcher Prof John Handmer is on the IRDR Scientific Committee, and was involved in the Sendai Framework endorsement at the 2015 Third UN World Conference on Disaster Risk Reduction, and later at Global Platform for Disaster Risk Reduction 2017. Since 2014, the CRC has observed the International Day for Disaster Reduction on 13 October, with public panel discussions supported by the Attorney-General’s Department. These events have been in Canberra with the Australian National University (2014), in Perth with the University of Western Australia and the Office of Emergency Management (2015), in Melbourne with RMIT University (2016), and in Sydney with the NSW Rural Fire Service, Office of Emergency Management and Risk Frontiers (2017). The sessions featured panels of speakers from a range of partners who explored Australia’s contribution to natural disaster risk reduction at home and in our region. Natural hazards research findings are exchanged between Australia and New Zealand under an agreement signed between the CRC and the New Zealand Natural Hazards Research Platform. The CRC also has Memoranda of Understanding with the US Forest Service, Association for the Development of the Industrial Aerodynamics (ADAI, Portugal), and the Coastal Resilience Centre of Excellence, University of North Carolina. The CRC is building and maintaining the skills and knowledge of partners, researchers, students, and the community. The national network of partners has created a lively forum for discussion, ideas, problems, issues, questions, answers and debate. The new knowledge is benchmarked, compared and measured. The benefits are mutual. All partners have access to all research outputs and contribute to the development of new research projects based on their own needs. Knowledge and learning is at the core of our business – to get that right is a major achievement for the CRC. A program of interactive and engaging events, publications and online activities for the natural hazards sector and for the research community, as well as the general public, is a key part of advancing the research of the CRC. The aim of all this activity is to make direct connections with people interested in the outcomes of the research program, and to encourage them to get involved, be engaged, and be a part of the progress of the CRC. The CRC and AFAC co-host the annual conference in a capital city each September, along with the partner organisations from that state. 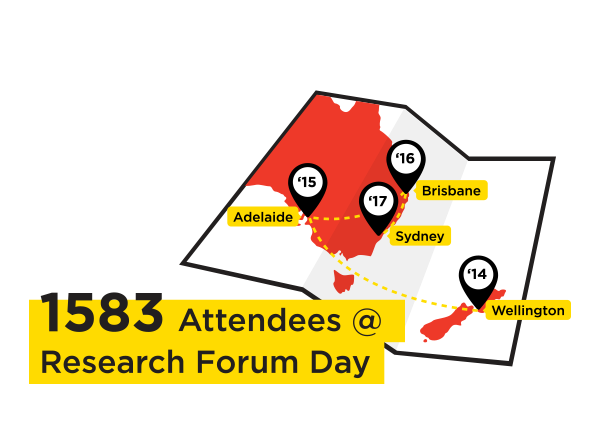 The CRC is prominent throughout the conference and in particular at the opening day Research Forum, which has attracted as many as 460 participants at a single event and more than 1500 combined. The full conference attracts up to 3200 people and the CRC has a prominent display in the exhibition hall. Annual conferences with the CRC have been in Wellington (2014), Adelaide (2015), Brisbane (2016) and Sydney (2017). Held in Queensland, New South Wales, the ACT, Victoria, Tasmania, South Australia and Western Australia over the last four years, these two-day events take place twice a year, providing the opportunity for CRC partners, project leaders and end-users to gain a complete overview of all the research activities within the CRC and participate in workshops to shape project research and utilisation directions. 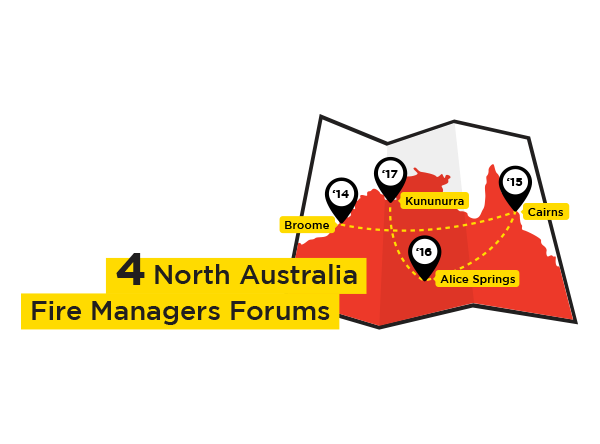 These forums include participation from AFAC, the Bureau of Meteorology, many universities and all fire and land management agencies across the regions to discuss issues of local and national relevance. The national Bushfire Seasonal Outlooks are formulated and released in conjunction with these forums. These outlooks are used by fire and emergency service agencies to work with state and federal governments to prepare resources for the bushfire season. 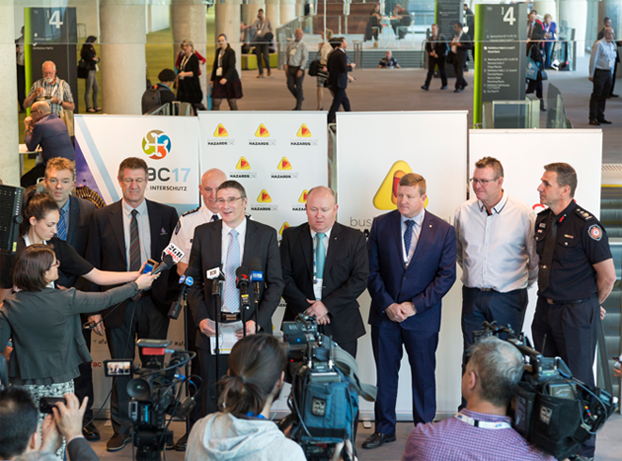 The CRC is a key partner in the annual Australian and New Zealand Disaster and Emergency Management conference in Queensland, the Emergency Management Conference in Victoria, and the biannual Australasian Natural Hazards Management conference. It takes a prominent role in the Emergency Media and Public Affairs conference, the Floodplain Management Australia conference, and several international conferences, plus many rural fire and emergency service regional conferences in NSW, Queensland, South Australia, Western Australia, Tasmania and Victoria. A range of products has been developed to suit the needs of the CRC partners and the public Hazard Notes, the CRC’s research briefing papers, are publicly available and are distributed through an extensive email database that includes staff in partner organisations, government, SMEs, small rural fire brigades and SES units, and regional councils. They are also shared more widely on social media. Hazard Notes are produced regularly with 43 currently available. The same email distribution list receives the monthly newsletter Hazard News. 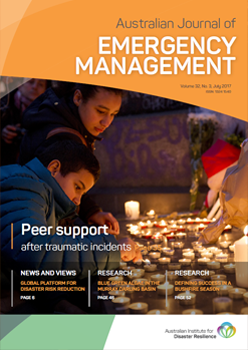 The Australian Journal of Emergency Management is a CRC-led initiative out of the partnership in the Australian Institute for Disaster Resilience. With a long history in the sector, this is the premier journal for emergency management in Australia, covering all hazards and all emergencies, with a print and online circulation of 5500. 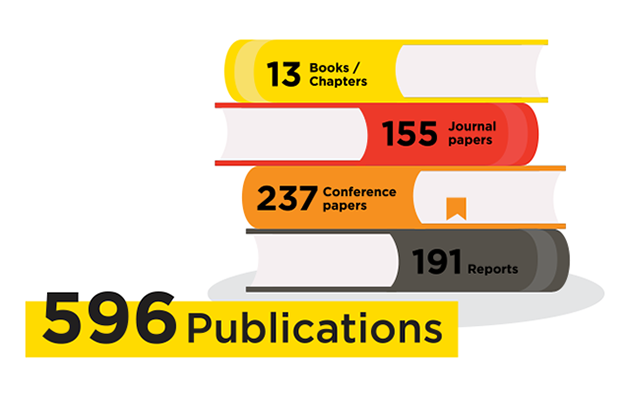 As an academic publication, the journal is regarded in its field within the national and international community for strong scholarly research underpinned by evidence. The Journal follows a double-blind refereeing process for research articles undergoing peer review. 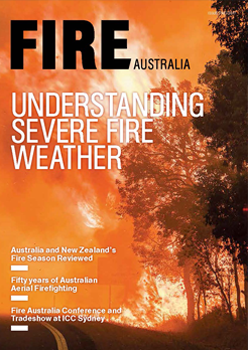 Fire Australia, a quarterly magazine with a circulation of 6000, is a further avenue for research promotion and is produced by the CRC jointly with the Fire Protection Association of Australia and AFAC. - The CRC annual conference with AFAC and Deutsche Messe features a trade exhibition with up to 190 exhibitors from the fire and emergency services and related industries, the majority of which are small-to-medium enterprises active in both Australia and New Zealand. The conferences also attract significant corporate sponsorship, including long-term sponsor relationships with global vehicle manufacturers Scania, Hino and Isuzu, and fire equipment suppliers Dräger, Motorola and Gaam. - The Fire Protection Association Australia, which represents more than 6000 SMEs, is a contributing member of the CRC and actively promotes CRC research to its members through Fire Australia, the FPAA newsletter and social media, and conferences. - Insurance and power industry representatives are regular attendees at CRC events, particularly at Research Advisory Forums and at the annual conference. The CRC is frequently sought out for comment by a range of national, international and regional media. Through the CEO and through experts across many disciplines, the CRC is well positioned to provide media comment that supports our agency partners. As an Affiliate Partner of the Australian Science Media Centre, the CRC is a key supporter of the promotion of Australian science. This partnership also places the CRC’s natural hazard research in prominent view of science journalists around Australia and internationally. Many international media frequently reach out for expert opinion, emphasising that the CRC is viewed as the authority on natural hazards research. Coverage in traditional media is amplified through the social media channels of the media, and the CRC and its partners. The CRC is active on Facebook, Twitter and LinkedIn, with a growing list of followers on each platform. Social media is an important channel to reach individuals and groups in addition to the regular CRC networks, including regional communities, volunteer brigades and units, local government, politicians, and international researchers. Peak times centre around the CRC’s Seasonal Bushfire Outlooks for southern and northern Australia, the Research Forum and annual conference, and major hazard events (prominently bushfires, floods and cyclones over summer). By way of example, in September 2017 the Southern Australia Seasonal Bushfire Outlook was covered more than 55 times across all media. This included live coverage on ABC24 and across the nightly news on all four networks, as well as The Project and Sunrise and major newspapers The Herald Sun, The Age, The Daily Telegraph, The Sydney Morning Herald, The Canberra Times and The Weekly Times. 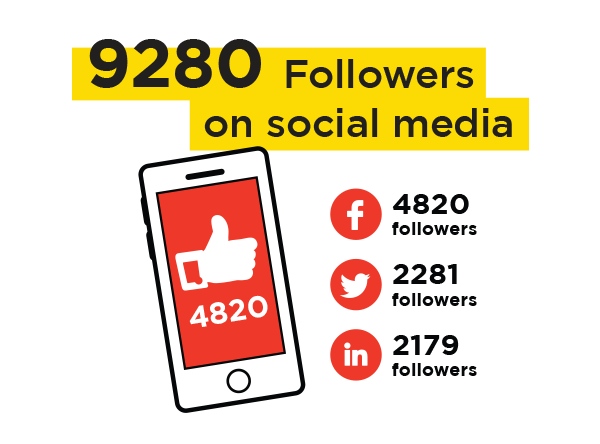 On social media, the updated version released in November 2017 reached more than 99,000 people on social media. Television, radio and website interviews have focused on the science emerging from various projects. Prominent commentary articles have appeared in The Conversation, The Australian, and the Australian Financial Review. All media mentions are listed on the CRC website. Media coverage is generated in conjunction with university and end user partners. Industry and trade media are key media partners, with the CRC contributing regular articles on the latest research findings and developments in Asia Pacific Fire (UK-based), Wildfire (US-based), and most partner agency publications. CRC research was also cited in numerous publications by the Climate Council. The CRC ensures that the research both informs practice, and that the practice informs the ongoing and new research. Integrated project teams of researchers and end-users are in place for every project to ensure the projects are informed by, and remain focused on, the needs of the partner organisations. Ongoing and active engagement between researchers and end-users is crucial to the success of each project. - Framing and ongoing review of the research questions. - Enabling access to data, information or people. - Identifying potential uses of research outputs. - Advising the project on how the research can be made more valuable to all partners and other potential end-users. - All states and territories. - All fire, land and emergency service agencies. - All types of participants, including policy departments, operational agencies and nongovernment organisations. The most visible example of this process is in the twice-yearly Research Advisory Forum. 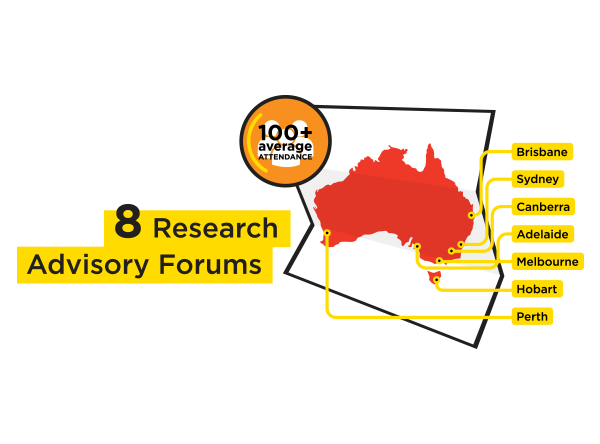 Research Advisory Forums were held in Perth and Melbourne in 2017, in Hobart and Canberra in 2016, Sydney and Brisbane in 2015, and Adelaide and Melbourne in 2014. These two-day gatherings provide the opportunity for CRC partners, researchers and end-users to gain a complete overview of all the research activities and shape the future direction of each project. Around 120 people attended each forum, with roughly half being researchers and half end-user representatives. Many of the integrated project teams also held regular workshops and teleconferences and made use of opportunities to meet informally at conferences and other events to maintain ongoing project communication. The CRC International Science Advisory Panel, which provides strategic advice and review of the research program to the Board of the CRC, is chaired by Prof Carmen Lawrence of the University of Western Australia and includes Dr Mark Finney of the US Forest Service, Prof Gavin Smith of the University of North Carolina and Dr Anthony Bergin of the Australian Strategic Policy Institute. - Partners are more confident to do their job. - Researchers are more engaged and focused on the use of their research. - The community is better informed and more prepared. More than 250 people across our 50 partner agencies have been involved in the concept development and ongoing engagement within the projects. The research has been in use right from the start with a seamless transition from the phase of data-gathering into utilisation. The integrated research project teams of end-users and researchers has created a capacity and capability in each group, and therefore within each partner agency, even as the individuals within these groups have changed over the four years of the CRC. The CRC is also building a capacity and capability of highly skilled researchers to undertake focused research for the sector. More than 250 researchers at the professorial to the post-doctoral level, are spread across almost 30 universities in Australia and New Zealand. In addition, the CRC is building this capacity with a new cohort of researchers at the postgraduate level working on natural hazards science. Four years into the program, the CRC has 91 PhD students, (41 scholarship, 18 completed, 32 associate) more than doubling its initial target of providing support to 34 PhD students for the full life of the CRC. The CRC conducts research in addition to the science funded through the Cooperative Research Centres Programme. This complementary research is undertaken through consultancies and other programs. The CRC is conducting research on a consultancy basis, mainly with its existing partners. The Victorian Department of Environment, Land, Water and Planning further extended its contract research program that began with the Bushfire CRC, across several projects on fire behaviour and fuels, planned burning, bushfire smoke dispersal and remote sensing. Post-event studies are highly valued by end-user partners, and are an effective way to gather important data after a major hazard. To date, community-focused research has been undertaken after major bushfires in New South Wales in 2013 and 2017, South Australia in 2014 and 2015, and Western Australia in 2014. Partners benefiting from this research are the NSW Rural Fire Service, Country Fire Service South Australia and the Department of Fire and Emergency Services Western Australia. Fire and Rescue NSW also received additional insight into the effectiveness of equipment and training provided to their Community Fire Units during the Blue Mountains bushfires in 2013. Queensland Fire and Emergency Services sought out the CRC to provide advice on how 2015’s Severe Tropical Cyclone Marcia would impact vegetation for the following fire season and beyond. More recently, QFES asked the CRC to lead a review of incident management activities after Severe Tropical Cyclone Debbie in March 2017. It is envisaged that this research could informed future operations and policy. The Office of Bushfire Risk Management on behalf of State Emergency Management Committee (now Office of Emergency Management) for Western Australia requested a review into the 2015 Lower Hotham Block and O’Sullivan Block fires. The CRC was also engaged to review traffic management policy in Western Australia for them Office of Emergency Management. This fund began in 2017 to encourage the development of short duration research projects meeting near term needs of end-user partners. These short-term funded projects address strategic issues of national significance. Research is being undertaken on how to improve the Australian Incident Reporting System, preventing residential fire fatalities, synthesising recommendations from natural hazard inquiries and reviews, assessing community resilience, and issues with building cladding and firefighting foam. End-user partners benefiting from this work include AFAC, the Metropolitan Fire Brigade Melbourne and Emergency Management Victoria. Support is provided for researchers to travel to areas affected by natural disasters, ensuring that the impacts and perishable data are captured in a timely manner. This can help to identify significant research questions arising from major natural hazards and provide a context for developing more extensive research proposals. The impact of heatwaves in the NSW Northern Rivers region, as well as western Sydney, and how the June 2016 East Coast Low affected the homeless, are examples of how the funds have been used, with reports available on the CRC website. Over the first four years of the CRC the ongoing development of the research program included extensive engagement with end-users, researchers and the broader community with a stake in natural hazards management. Under the watch of the International Science Advisory Panel, the research program was mapped for progress of utilisation opportunities and to develop new projects for the coming years. Major outcomes for research utilisation include the many conferences where these publications were presented and discussed with end-users, and the use of the research by partners as outlined in the following case studies.